My thought was, If they turn out well, I'll freeze and take them, and if not, we really don't need the extra starch anyway. Well, I'm taking them, and I kinda hope they don't all get eaten, because I'm already thinking they'll make a mighty fine bread pudding. I think the dough would be good for other things too---like warm caramel pecan sticky buns.... Okay, enough of that! Time is running out, and I have to decide on a vegetable. Dissolve the yeast in the warm water, then mix with the pumpkin, sugar, egg and salt. Add half the flour, and then as much more as needed, a little at a time, kneading until a firm, elastic dough forms. Add the butter in small pieces and continue kneading until it disappears and incorporates into the dough. Add a little more flour if the dough becomes too soft and sticky (you're going to have to roll this out later). Deflate the dough and divide into 3 equal portions. Round each piece and let rest 20-30 minutes. Roll out into 12" circles, and spread with the softened butter. (It will take around 2 tablespoons per circle.) Cut each into twelve wedges---a pizza cutter works best for this. Cut a small notch in the center of the curved edges. Stretch each triangle from the curved edge to the narrow point, and then widen the curved edge to open the notch by pulling out from the other two corners. 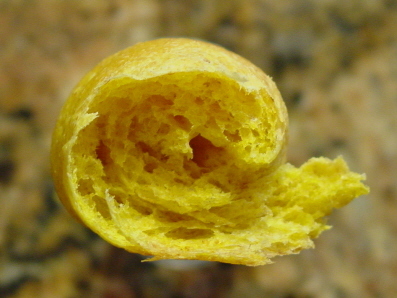 Roll up, beginning from the notched edge. Place the rolls on lightly greased sheet pans, with the points tucked underneath, and curve into a crescent shape. Let rise until doubled. Bake at 400F for 14-20 minutes, until golden brown. Thanks for posting this. I am going to make these. I can't stop thinking abou them. 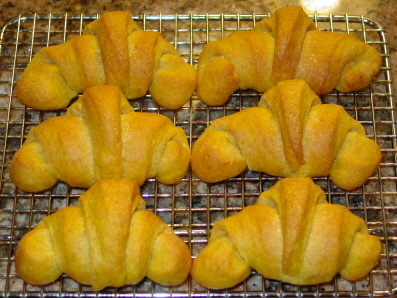 They are a work of art - never thought of putting pumpkin in crescents. Did I say they look marvelous? Can't wait until I can try these things. Your crescent rolls look wonderful! What a fun adaptation for fall 'country house weekend' breakfasts. I'm going to try to adapt these to my Zoji bread machine. I think there must be a way to make a reasonably nice croissant dough in it (at least up to a point). Thanks again. Thanks Judy! The Zo would be a perfect mixer for this. I would have used mine, but I made the full batch (a little over 3 pounds of dough), and my machine works best with 2 pounds. Just use 2/3 of everything, except I think you could use the whole egg and reduce the water by a tablespoon or so. Enjoy! Well, there were 20 people at the Thanksgiving meal, and about 20 less rolls at the end. Considering all the other breads and starches on the buffet, I think they went over quite well. But, I was happy to have a few leftover to bring home and experiment with. While perusing the refrigerator the next day for lunch options, I couldn't help but notice that the leftover turkey brats staring at me from the top shelf, were about the same length as these crescents. Coincidence or destiny? Yum! What a nice combo. Yesterday was bread pudding day. 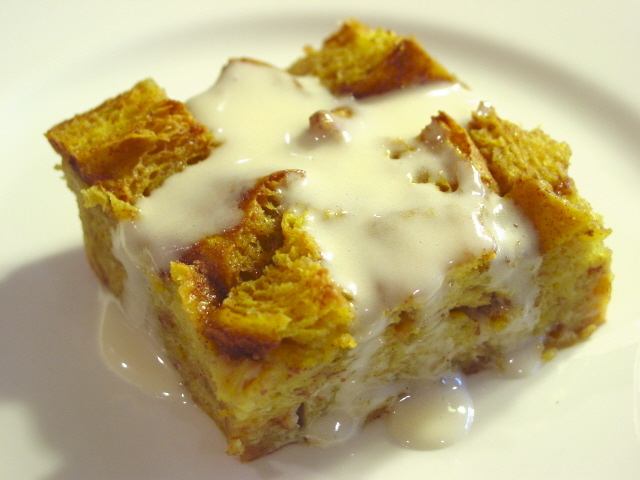 Bread pudding is something I really like.... sometimes.... depending on who makes it. I haven't been happy with any of the recipes I've tried in the past---too eggy, or too sweet, too spicy, or just too... something. I looked up several different recipes and found that they vary WIDELY in ratios of bread, milk/cream, eggs and flavorings, so I decided to make it up as I go along. Well I DID make a few (can't spare eggs, the hens have stopped laying) because I realised that I could leave the dough overnight, bake them in the morning and take them to an American friend in the afternoon. So that was a genuine American appreciation and I felt like a million dollars! The half pumpkin which was left I made into a pie, eggless, with ground ginger, tonight. Spouse said he didn't like pumpkin pie but he had some from politeness and thoroughly enjoyed it! The only ones he's had before were made with canned pumpkin. I wish I'd not been so profligate, I'd have liked to try the sage recipe :-( However, I've put the recipe in a safe place against the day, thank you! So glad your friend enjoyed them. These are rich enough from the butter alone, that I'm sure you wouldn't really miss the eggs that much if you were to swap them for an equal volume of water. The rolls may not rise quite as high without eggs, but I'm sure they'd be very tasty. I made these wonderful morsels on Thursday. This recipe is a keeper! I was too anxious and didn't take the time to roll them out right - just spread them with my fingers and free-formed them. Not pretty like these are, but they were delicious. With the extra pumpkin I made my pumpkin bread I'm trying to perfect that I'm putting cream cheese in - boy is it moist.